Custom Cart Wrap? 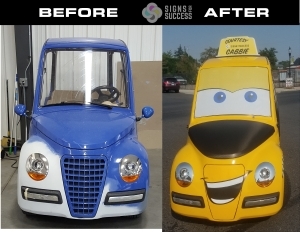 Here at Signs for Success we have had the opportunity to create and install a lot of unique custom cart wrap s over the years. This Summer we finally got around to wrapping one for us. 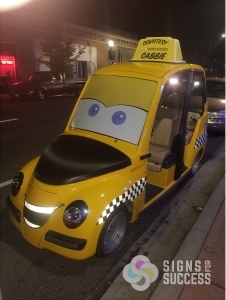 “Cabbie” is themed from the Disney movie “Cars”. The movie didn’t have a cabbie but we now have one. “Cabbie” is a 2001 LIDO NEV (Neighborhood Electric Vehicle). The LIDO is the brain child of Lee Iacocca, who wanted to get in on the market as the Baby Boomers were retiring. ”People are retiring early,” he told The News in 2002. ”There are 15,000 gated retirement communities where you don’t need an extra car.” The Lido does have that PT Cruiser look which is no surprise considering where the idea comes from. This custom cart wrap features AVERY DENNISON SW 900 Gloss Supreme Wrapping Film in Gloss Dark Yellow for the base color. For eye attracting accents the checker board, mouth and logos use 3M reflective wrapping vinyl. Original design had the hood in yellow but was then changed to a 3M Black Carbon Fiber film to give the nose more definition and texture. The windshield is perforated window film so you can see forward and the eye balls are PT Changeable so we can move the eye balls easily to different positions creating different moods or expressions. 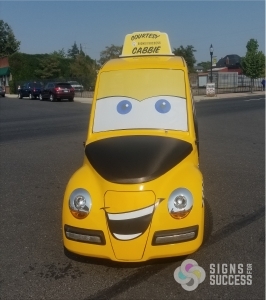 Signs for Success will use the “Cabbie” for running back and forth between the buildings at our location. Additionally the Courtesy Cabbie will be taken to charity golf tournaments for use by the hosting organization. Staff will be able to help sponsors deliver displays and other swag to their holes or location, assist with getting sponsors to and from restrooms during the tournament and make for fun and memorable photo opportunity before, during and after the event. With all these great features going for it, a reflective custom cart wrap makes a great addition to any marketing plan. Signs for Success is a locally owned family business in Spokane, and we strive for excellent customer service, perfect color, and quick turnaround on every project. Our large production facility allows us to design, print and install everything in-house. Contact us for a free quote on a custom cart wrap today! SEE MORE CART WRAPS! Storage Tank Graphics at New Litehouse Location Fleet Advertising Graphics for Norlift!